As Congress continues to debate additional loans to help rehabilitate the Big Three and their suppliers, the following special report documents the colossal contributions the American auto industry has made to our national economy. Assuming the validity of our analysis, the question must be raised: Will Congress be willing to allow the domestic auto industry to fail and forgo similar benefits to our economy over the next 100 years? We, the taxpayers, are morally obligated to help. And even if our political leaders don’t care about Detroit or the failure of the auto industry, the public should be distressed about the impact the demise of the Big Three and their suppliers would have on our national security. 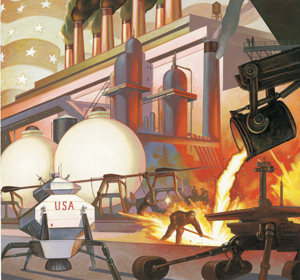 Historically, American automakers and their supplier base led a rapid redeployment of resources to ensure the country was protected against massive foreign armaments during World War I, World War II, numerous overseas hostilities, and the present military conflicts in Iraq and Afghanistan. If we allow the American auto industry to fail, the automotive supplier base won’t be far behind. And the tribal knowledge of rapid resource redeployment and highly specialized military engineering and production techniques will be forever lost. As a result, America would have to rely on other countries, including Third World nations, for the research, development, and manufacturing of military armaments, tanks, bombers, and numerous other components. Do we really want to share our state-of-the-art technology with Third World despots? Considering the massive contribution the auto industry has made to the national economy over the last 109 years, coupled with the national military defense issue, the loans the federal government has dispensed or may yet dole out are trivial compared to the funds it’s spent on the war in Iraq ($600 billion to date) or the Wall Street bailout (up to $2 trillion). We cannot allow the Big Three or their supplier base to go down; it’s simply not an option. If all else fails, the federal government must nationalize the Big Three (as bad as that might be) before they allow a bankruptcy. The automakers deserve that respect. However, they also need tough love; the government loans cannot be a social handout. An orderly reorganization, with reasonable oversight, is the optimum solution.